Contact customer service for more information about our current door sample program. 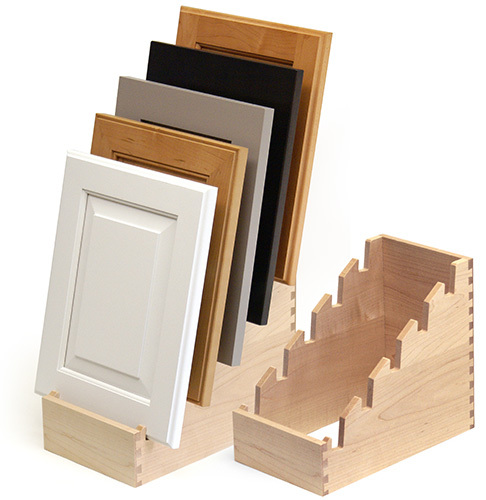 Request up to two 12″ x 15″ prototype sample cabinet doors per order for a reduced price. Contact customer service for pricing (customer discounts do not apply). In most cases, the lead time for an Applied Moulding door with a Glaze finish will not exceed six days, even for solid colors. 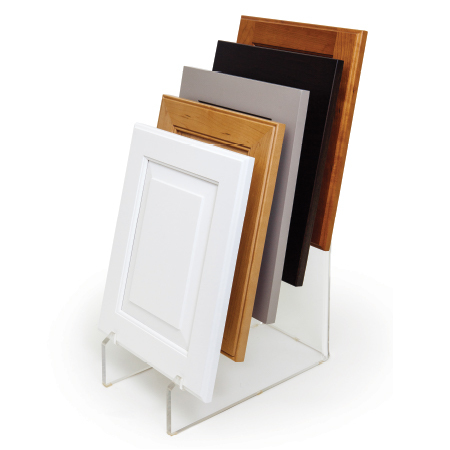 Request one free 12″ x 15″ sample cabinet door of your choice when your cabinet door / drawer front order is $1,000 or more. Order your sample door unfinished or finished in any Keystone color (excluding custom color matches). *Free sample cabinet doors may be of any design except Arch Moulding doors, Special Mullion doors, Radius doors, or Open Louvre doors. Other restrictions may apply. Contact customer service for details. Our Sample Door Display is dovetailed and constructed of maple. It holds five 12″ x 15″ sample doors. The display base measures 11 1/2″ high in the back, 3 3/8″ high in the front, 8″ wide, and 13 5/8″ deep. Doors are sold separately as described above. 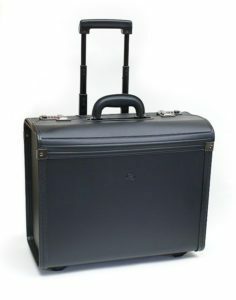 Our Sample Door Carrying Case is made of durable, attractive vinyl, has two inside collapsible dividers, two programmable combination lock closures, a telescoping handle (shown not fully extended), and two wheels.